I had a partial can of pumpkin leftover from a recipe and I was in the mood to make donuts. Now we have Pumpkin Donuts with Chocolate Glaze. There are so many reasons why I like these donuts – Pumpkin, Chocolate, Baked, Easy, Delicious and they are GFV (Gluten-Free Vegan). Another reason why I like these donuts is that they are stirred and baked in under 30 minutes. The hard part is waiting for them to cool down to dip in the Chocolate Glaze, but totally worth the wait. Stir all wet ingredients together, until well combined. Set aside. Whisk together dry ingredients, until well combined. Combine the dry and wet ingredients together and stir. Spoon batter into a Zip-top bag. Snip the corner and pipe batter into a donut pan. Bake 15 minutes. Set aside to cool for at least 10 minutes before trying to unmold the donuts. Combine chocolate chips and almond milk. Melt chips over a double boiler or in microwave. If using microwave, melt chips at 30 second intervals and stir. 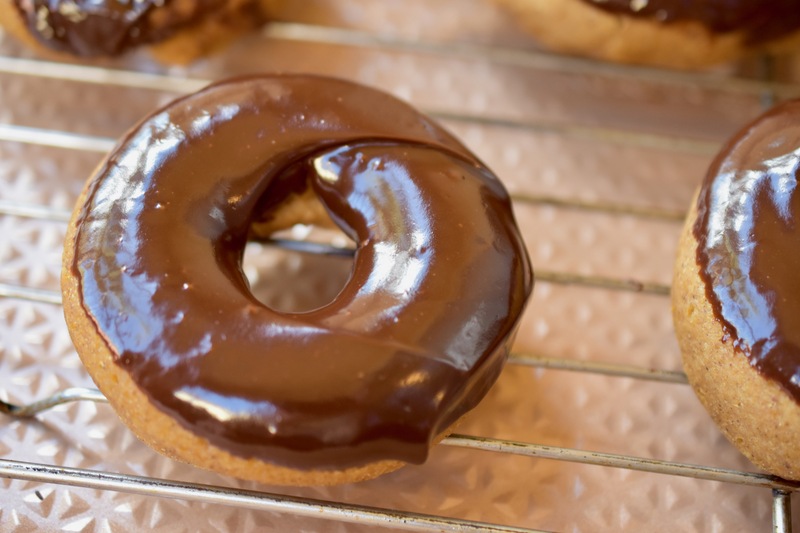 Dip donuts into chocolate glaze. Twist donuts as you remove them from the glaze to prevent drips.